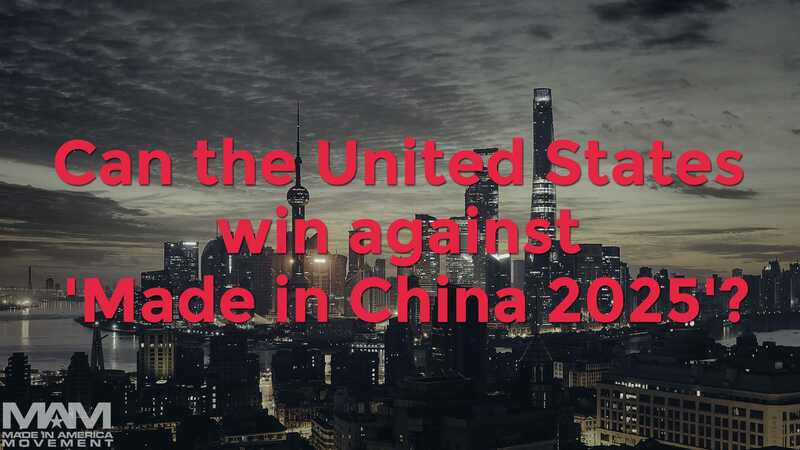 Can the United States win against ‘Made in China 2025’? The Chinese government is putting the full weight of its power behind the Made in China 2025 initiative to dominate global high-tech manufacturing. The initiative was first announced in 2015 and is now picking up full steam. Can the US and other countries compete against the communist country’s efforts to compete against our free markets? China 2025 reflects Beijing’s longstanding development goals. Since the market reforms of leader Deng Xiaoping in the 1980s, the ruling Chinese Communist Party (CCP) has pursued a mixed economy that combines socialist planning with elements of private enterprise. In recent decades, the CCP has taken steps to shift the economy away from resource extraction and low value–added, low wage manufacturing—largely mining, energy, and consumer goods such as clothing and footwear, which make up almost half of the country’s economy—to a high-tech, high-productivity economy. China 2025 is intended to push the economy through this difficult transition and over the so-called middle-income trap, in which growth plateaus as wages start to rise, that has bedeviled many other developing countries. Could this be good for the US? Yes and no. It is generally good for the US and other developed countries when new markets open up and the people in those countries become more wealthy. This is because they are able to buy more goods overall, and in a free market, that means that some of those goods will be purchased from other countries. “China aims to achieve 70 percent “self-sufficiency” in high-tech industries” would be a good thing. The Chinese (communist) governments goal of creating a dominant position in global markets by 2049 is the concern. For the United States and other major industrialized democracies, however, these tactics not only undermine Beijing’s stated adherence to international trade rules but also pose a security risk. The Chinese government does not provide a free-market and has been shown multiple times to create barriers to foreign companies trying to reach the Chinese. Potential negative effect on global poverty. We would love to see more of the Chinese people lifted out of poverty but only if there is an equal opportunity and for everyone in the world in similar situations. Capitalism lifts people out of poverty. The number of people living in extreme poverty worldwide declined by 80 percent from 1970 to 2006. Poverty worldwide included 94 percent of the world’s population in 1820. In 2011, it was only 17 percent. It’s an incredible shift that doesn’t receive a lot of media coverage because it highlights the success of capitalism. However, the Chinese government does not support free-trade or provide an equal opportunity for the rest of the world. As one of the top 3 economies in the world, it’s not only not fair but could drastically slow down the improvements for those still living in poverty around the world. Can the US compete? How should the US and other countries respond? We want to hear your thoughts below. I believe that the US can put China out of business easily. Companies in the US spend their money on R&D while under communist China, their R&D has been focusing mostly on military. So they steal our IPs and spy on our companies to get our technologies. Trump will teach them a hard lesson. President Trump is fighting against companies having their products made in China. Thank God for his strong leadership and values. Then Trump is fighting his own company– his company manufactures much of his merchandise in China, as does Ivanka’s company. Don’t by the hype he is putting out, do a simple google search and you’ll see the truth. The word is “recipical”. Trump stated that repeatedly. We need to mirror their trade barriers and in real time. Government law makers seam to forget they tarrifed and blocked use first. We need to respond in kind. The trade war has been going on for some time now. We just have not been fighting back. How do I get mam clothes? Can put China out of business easily? If it is that easy then what’s stopping us? You can do all the R&D you want. If you don’t have a factory with TRAINED people to work for a wage that is FAIR to Americans then you have nothing. We certainly have an over abundance of deserted buildings in every city throughout the USA that could be turned into factories, warehouses…how does the USA plan on training all our people to become industrious once again? How will we handle the pollution, the waste, etc. that China deals with every day for manufacturing the world’s products???? Everyone wants to criticize China. I guess we didn’t think it through very well when we greedily gave our jobs away. Maybe we need to put our intelligence and energy into some new products that will change the USA for the better, and help the world, versus thinking we can actually take back all the millions of gadgets, trinkets, clothes, shoes and start up production because the Republicans tweet about it. Right on Rachel . While i will never trust a communist country .. Wall street is the real enemy to Americans made products and American workers through their greed . Being an American based manufacturer I can say it’s not easy being “Made In America” but we are proud of our little company base here in Eugene, Oregon called Bike Friday. We are the only folding bike company, long-tail cargo bike companies and one of only 5% making E-Assist E-Bikes here in the U.S. If we can do it so can others. I’m sure that the US can compete with China on the development of all products. The culture in the USA is open to new ideas and provides opportunity. The culture in China is different and restrictive. As long as the culture in the USA remains committed to free thinking, honest and open debate along with the peoples support for products made local there is no reason we can not compete. When you see people in the US struggling to get to China to start businesses then we can’t compete. I have developed and working on manufacturing a commodities product here in the US. It’s a challenge but I believe it can be successful. I do need a little help but completely confident it can work. I would like to start a more specific movement called ‘The Great American Commodities Challenge’ where small businesses use high technology to manufacture commodities usually found ‘Made in China’. Were only going to win by utilizing the latest advances in technology and being smarter. Digital manufacturing can bring back production to the U.S. China might have a cheap labor force to exploit, but the power of small scale factories are on the rise and I believe the shift can very well happen.